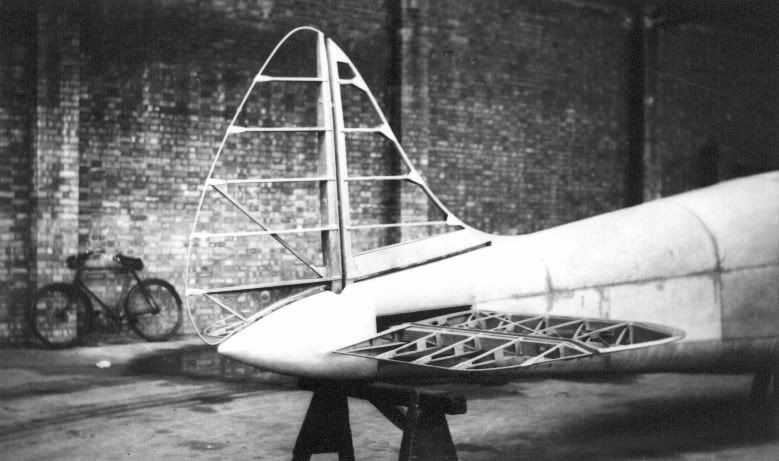 Here's a photo of the empennage of the unfinished first prototype - possibly the one lost in the fire! This one was designed and built by Geoffrey Wikner (of Wicko fame) after he left Miles Aircraft at Woodley but before he designed the Wicko G.M.1. He told me that it was later redesigned as a four-seater powered by a Gipsy Six - the Marendaz Mk III. So I wonder if this was the Mk I or II ? I will try to find time to post a picture of the incredible Gurney Grice Mosquito- straight out of ''Magnificent Men/Flying Machines'' in style if not actuality. Some aircraft are described as a 'flying coffin' but this really was one! Could these have been the wings in question? Yes they are two of my photos taken at the time, we had just got them down. Last edited by RPSmith; 23rd December 2008, 18:49. A Blenheim, Beaufighter and Beaufort - together in one Museum. Who'd have thought that possible in 1967? Another glider building company in Dunstable was Hawkridge who built a Grunau Baby type and side by side two seater (similiar to the T-21 but earlier design) called the Venture. The Grice and Young factory at Dunstable made DH Mosquito aileron differential gear(source "Mosquito"by Sharp & Bowyer). Another company ERA made machined fittings. Remember seeing the Dart Kitten G-AMJP flying at Skegness Ingoldmells in 1966, it was my fathers initials ! Last edited by T-21; 23rd December 2008, 20:02. Not me Roger - although I recognised Jim's leather elbow patches! BTW - G-INFO lists G-BAPC as still being registered to the two of us! [QUOTE=T-21;1338988]Another glider building company in Dunstable was Hawkridge who built a Grunau Baby type and side by side two seater (similiar to the T-21 but earlier design) called the Venture. .Hawkridge was formed in 1947 by Zander and Bolton, they also built a few daglings. One of which i am part owner , this is a nacelled Dagling. Nigel Ponsford also had the remains of a Hawkridge Dagling. I have a friend who worked for Hawkridge. blimey, take me a while to work through that lot. Firstly yep a source has linked Nigel to the wings at Coventry, he was also fairly positive that they were from G-AEPD, digging into this a/c I pulled up the CAA sheet and it also backs up the info I was given that G-AEPD was in fact never meant to be the Minor prototype but the next generation Buzzard! If you look on the pic of the CAA record its obvious the plans were changed with this registration being used by the Pou type design then the Minor with both constructors numbers being switched and the 'Tandem wing' replaced with mono. Roger many thanks for the personal account; I doubt I could have ever dug such detailed info, could the farm have been just north of Anstruther? one contact has hinted at it may have been stored at the now defunct Dunino airfield/farm?... Dave has given me a contact for Nigel and I will chase him to see how things stand at the minute. Hi T-21 and merry Christmas to you too, I had briefly chatted with Dave about Dart and its location and I did wonder if this was any connection. Sandy Sproule has kindly contacted me with information and pictures about his dad, one scan talks quite a lot about the Scott Aircraft set up. I will over the next few days read through it all and try and post up some of the info as I think there is quite a lot of interest in general about these company’s' being linked together. Buster, please do. I have set a basic website (www.bartonleclay.org) with a direct email of archive@bartonleclay.org to start to get all the information in some order any memories your father has would be very appreciated. soo G-ORDY, one dead end is proving to be the Marendaz aircraft! I will PM you if that’s ok as I need to establish a who's who as I am not that aviation 'savvy'!! Last edited by Jenna; 23rd December 2008, 22:13. Found these pictures of the first incarnation of G-AEPD with its tandem wings... it’s this a/c that went to Anstruther and the wings could well have came from. These pictures are taken at Barton showing the middle hanger. other little things that have been un earthed is that fact I am now sure that the buzzard's first engine was in fact 'borrowed' from a Morgan aero ( the Morgan archive as told me that up to 20,000 aero’s were built but only a small majority with the Anzani 8 engine), the Squirrel it was built with had continuous starting problems so pre maiden flight the team removed an Anzani twin from a handy Morgan... this engine was then reworked for the Mk2 Buzzard with an improved valve train and twin magneto set up... it led on to the Luton Anzani engines. this is the list (excluding G-AEPD and the prototype!) of airframes ( i'm getting jargon now ) that so far have direct links to the airfield at some time. A few other a/c have been reported to me as being at the airfield at some time for some reason like Old Wardens Dessouter and I will look into these more early next year. I've just emailed you a PDF scan of two articles I published on G-AEYY back in 1977/78. There was no mention of Barton in connection with the Martin at that time - is there any hard evidence that it was ever there or is it an assumption? Harold Best-Devereux told me at the time that it was test flown from Denham and (after he rebuilt it with the new fuselage) Heston. Hopkinson based it at Barton but that was Barton near Manchester not Barton, Beds. He lived in Audenshaw and served in the RAFVR at Sealand. He flew over 250 hours on it until he damaged the u/c during a precautionary landing near Stoke on Trent in early 1939. Last edited by G-ORDY; 24th December 2008, 16:00. The Martin monoplane fuselage was painted red the last time i saw it a few years ago. It still had a few bits with DH 53 marking's on, which surprised me. I thought they would have been used on the G-EBQP rebuild. When it arrived at Henham it had the red fuselage but you could see traces of green under the red. Zander & Weyl were interned on the Isle of Man during the war and their assets were taken over by the Government. Dad worked at the factory that is now where the Honda dealership is opp the Wagon & Horses. Lots of local detail can be found via the Peoples War, a book was available at the Book Castle. Whipsnade's most wanted BIG BROWN BEAR! I only saw Martin Monoplane a few times at the farm at Henhan. It was at the back of the barn. When i picked up the Hawkridge Nacelled Dagling. I didnt see it again for around 20years, when some German friends bought the Kranich 1. Here's a photo of the empennage of the unfinished first prototype - NOT the one lost in the fire! Tommy Rose introduced him to Marendaz, who funded the project for a wire-braced monoplane which was to have been powered by a Pobjoy radial. It was built during 1935-36 (I don't know where) but Marendaz broke the verbal contract and Wikner stopped work. G-AEGG, from G-INFO first registered 23rd March 1938 ( yet the file number is /37.. 1937? ), registered in DMK Marendaz's own name at 'Barton Airport'.. was this the plan for site which he owned/leased at this time.. he owned General Airports Corperation ltd!!! Constructors number on this registration is number 2, is that not weird as it’s called Mk3?.. what happened to numbers 1 and 2?... lastly the withdrawn from use date ties in with the auction held December 1940 of the company’s' property/stock ( there is a mention of a Marendaz airframe in the auction list!). Filght Archive has an editorial piece on the partially built airframe in February 1936... It states it was being built at Maidenhead so Woodley makes sense... remember Maidenhead is Marendaz's home area and his former car factory was at Cornwallis in Maidenhead... but was Wikco in Eastleigh at this time? The G-INFO pdf lists the constructors number as 'ABT.1' ... no idea what stands for! Several sources say this aircraft was flown to RAF Halton in 1940 and given to the ATC unit after it was never required for impressment... from then on its a dead trail. Two page editorial and some interesting pictures…. whilst on the subject of G-INFO logs the first column lists 'certificate number' I have thought this referred to a C of A but as some of the aircraft never got that far that cannot right so is that number the license number of the registrant... if so can I cross reference that back to the licensing peoples records... but then why would the two Marendaz aircraft have different certificate numbers? Last edited by Jenna; 26th December 2008, 12:12. I'm afraid that I have little more to add to what I've already said on the Marendaz project. I was in contact with the late Geoffrey Wikner (cousin of Edgar Percival) back in the 1970s and he sent me photos of his work in England during the 1930s. The unfinished Marendaz project was one of them but all he said was what I have already mentioned. I suppose - and this is just supposition - that the incomplete and un-registered Wikner-built aircraft may have been c/n 1, which would explain why G-AFGG was c/n 2. Presumably the Wikner-built aircraft was the one lost in the fire ... insurance job? On the subject of the Martin Monoplane I have dug out my correspondence with Harold Best-Devereux (who built it), Mike Russell (who acquired it in 1977) and A.J.Jackson (Author and Historian) - all now dead I'm afraid. This photo was taken at Denham aerodrome (H.B-D is seated in the cockpit) and shows the original Martin Monoplane in October 1937 shortly before it's abortive delivery flight to Barton (Lancs). A plug worked loose in one of the two cylinders of the 32hp Bristol Cherub III and the aircraft was badly damaged in the ensuing forced landing. Close examination of the lower line of the fuselage shows a distinct kink - this was the Clarke Cheetah fuselage. H.B-D designed and built a new fuselage in two weeks and this is the one seen in the earlier post and which is extant today. The newly rebuilt aircraft was test flown from Heston before delivery to Barton. All references say that the aircraft was built at Gerrards Cross and the only Barton involved is Barton in Lancashire - I very much doubt that the Martin Monoplane in either form ever visited Barton in the Clay. H.B-D said that the rudder carried the serial from one of the two airship Humming Birds (J7375/6) but he couldn't remember which. Inspection dates in the wings pointed to one of these aircraft too. Mike Russell chose the identity "G-EBQP" because he belived it's C.of A. had expired in 1929 and it would be a likely candidate for parts to go into the Clarke Cheetah. A.J.J. pointed out that G-EBQP was complete at Heston on 29 March 1934 and it was destroyed in a fatal accident at Hamble on 21 July 1934 so there is no way that the aircraft currently registered as G-EBQP has any connection with the genuine article ... although that is not to detract from the fact that it does have the rudder from one of the airship Humming Birds - we just don't know which one! Last edited by G-ORDY; 26th December 2008, 12:19. Last edited by Jenna; 26th December 2008, 12:28. Geoffrey Wikner built the first prototype of the Foster-Wikner Wicko (G-AENU) in Lusty's Works, Colin Street, Bromley-by-Bow, London E3 and test flew it at Stapleford Tawney in Essex in July 1936. This was after the Marendaz project. The Southampton production line was not established until 1938. A.J.Jackson states that the unfinished first prototype (c/n 1) of the Marendaz was built at the Cordwallis (sic) Works, Maidenhead, but lost when the factory was destroyed by fire in July 1937. As Maidenhead is very near Woodley (where Geoffrey Wikner had been in charge of the experimental shop) it is quite possible that Wikner built the first Marendaz in a corner of the car factory premises, it was probably stored in its unfinished state until lost in the fire in July 1937. Again - this is all supposition. What was the reference to the Martin being "drafted" at Barton? Harold Best-Devereux was responsible for the design and construction (he was an engineering & design student apprenticed to Latimer-Needham) and he said Gerrards Cross when he corrected my original typescript (which I still have - together with his covering letter). Last edited by G-ORDY; 26th December 2008, 13:44.